The Canadian Football League runs deep in my family. My father and his father were at many of the classic Grey Cup games played at Varsity Stadium in the 1950s. My grandfather had Toronto Argonauts season tickets for years, and I attended my first game in his seats with my father at CNE Stadium in 1971. After my grandfather died in 1972, my father was surprised to learn that those tickets actually belonged to my grandfather’s business and didn’t transfer to him. So, in 1973 my father ordered his own season tickets for our family. This meant a move from the old, covered grandstand to the new bleacher seats on the other side of the field. In those days before the stadium was renovated for the Blue Jays, CNE Stadium held 33,000 fans and was always sold out for the Argos. I remember attending a game in August when the temperature was 100 degrees (no Celsius back then!) and a playoff game in November that ended in a blinding blizzard. But with Ottawa set to face Edmonton in the Grey Cup this weekend, I have a memory of a very different sort. Many will remember Ottawa’s last-second victory (over Saskatchewan) with the Tom Clements to Tony Gabriel touchdown pass in 1976. Others, the 1981 game where Dave Cutler’s last-second field goal kept the Eskimos dynasty alive with a win over the surprising Rough Riders. But I remember 1973. 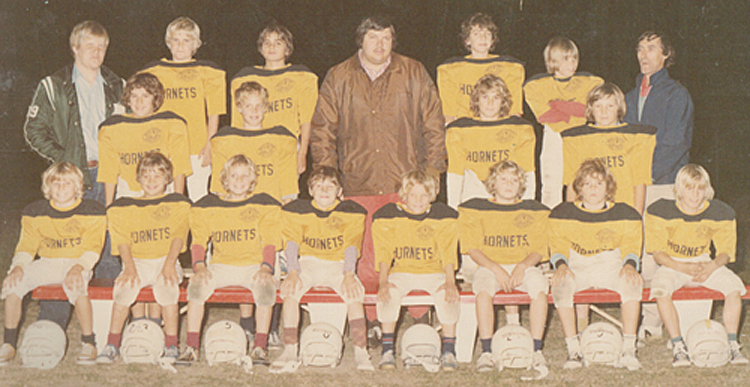 My first football team. I’m in the top row, next to our enormous coach. The first Grey Cup game I remember watching is 1971, when Leon McQuay’s late fumble sealed Toronto’s loss to Calgary. I started playing football in 1972, and my greatest athletic accomplishment remains leading our Zion Heights Grade 9 intramural football league in scoring in 1977. I loved football. My brother David liked it a lot. Jonathan … not so much. Still, my parents tried to keep things fair. We all took turns going to games, and we all got to fill out the ballots in the program to vote for the Shopsy’s team MVP. One lucky winner among the MVP voters would receive two tickets to the 1973 Grey Cup game which was in Toronto that year. Jonathan won! He couldn’t really have cared less, and I wanted to go so badly… but it was his ballot that was drawn and his name on the letter that arrived at our house with the tickets, so he went to the game and I watched on television. Long before any of us starting watching, Albert Henry George Grey, the 4th Earl Grey, was Canada’s Governor-General from 1904 to 1911. He was a big sports fan – as many of his predecessors had been. By 1908, he had already donated namesake trophies for the Dominion trapshooting championship and for horse racing. 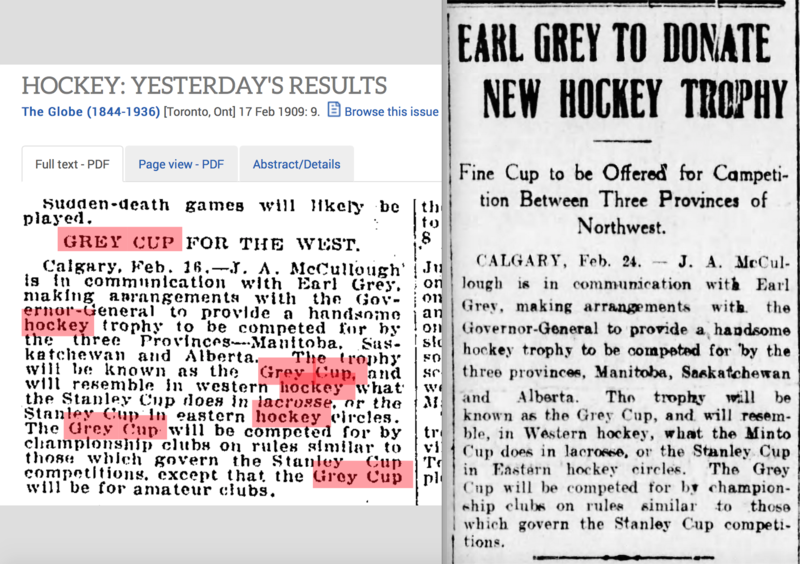 According to almost everything you’ll ever read about the history of the Grey Cup, the Earl originally intended to donate a new trophy for the senior amateur hockey championship of Canada in 1909 since the Stanley Cup had been recently taken over by the professionals. But Canadian businessman Sir Hugh Montagu Allan had already beaten the Govenor-General to the punch, so he gave his trophy to football instead. 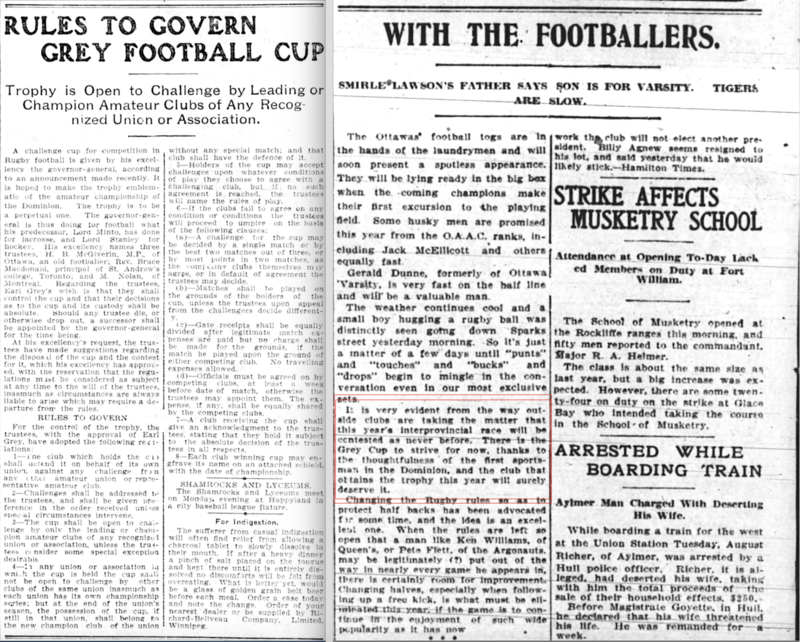 The article on the right is from Vancouver Daily World on February 24, 1909. But this story is only partly true. 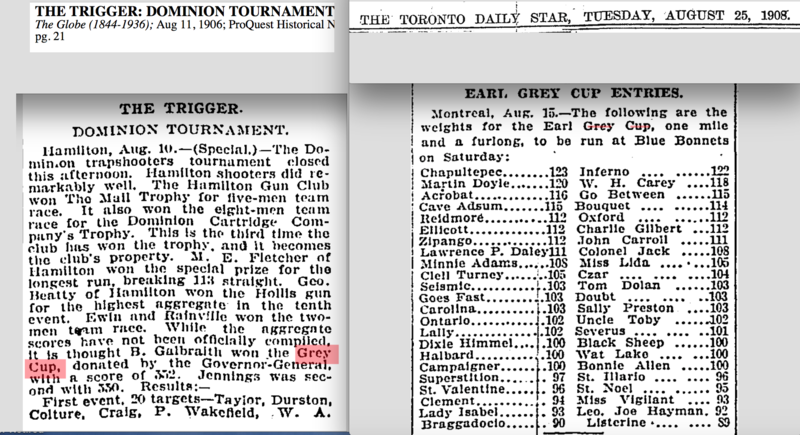 In an era when so many Canadian championships were contested exclusively in the east, the announcements concerning Earl Grey’s new trophy in February of 1909 clearly state that it was intended only for competition among western hockey teams in Manitoba, Saskatchewan and Alberta. From the Toronto Daily Star, June 1, 1909 and the Brandon Weekly Sun, June 3, 1909. From the Winnipeg Tribune, June 12, 1909 and the Ottawa Journal, September 2, 1909. By the time football teams were preparing for the new season in September of 1909, the Grey Cup was already being touted as a boon to the game. First won by the University of Toronto on December 4, 1909, the evolution of the trophy and its many great moments are much to long to go into here, but the Grey Cup remains a unique part of Canada’s sporting history – and of my family history too. Fascinating stories, both familial and historical! As always, an interesting and informative article – thanks! My Grey Cup memories are probably a little different than most! I was playing piano at the Royal York from 1968 – 71. Of course, at Grey Cup time, the hotel was full of fans from the West. Playing in what was the Imperial Lounge (now the Library Bar and entrance to the Imperial Room), I had a ringside seat for all the Grey Cup-related shenanigans going on in the lobby, and there were many! But the very best memory is of watching a horse with rider in complete Western gear riding around the lobby of The Royal York, as though it were just an everyday thing! There was a lot of jaw-dropping, and I’m quite sure a few people thought they might have imbibed just a little too much, because this couldn’t possibly be happening – but it WAS!!! Enjoy the game on Sunday and keep sending “the good stuff”! Neat story. Quite interesting that Grey thought the Stanley Cup was an eastern thing, since Brandon had competed for it as recently as 1907. There are a couple of things in the hockey articles that are slightly off … but, unfortunately, you never really know in the papers from those days if it was the writer who got it wrong, or the subject of the story! And I would think IF he thought a trophy was too Eastern-biased, it would be the new Allan Cup he was worried about! My guess – and it’s no more than that – would be Grey was assured that western teams would be able to compete for the Allan Cup (the Winnipeg Victorias would win it in 1911) and that football was in much more need of a national championship trophy. Yes, we were indeed an Argos family in the pre-Blue Jays days, weren’t we?? I remember well all of our excitement (and your jealousy!) when that letter arrived informing me I had won the Grey Cup tickets. Good times. Dad had to attend a funeral that day (I’m pretty sure it was Great Uncle Harry, whom you mentioned a few stories back on Remembrance Day) so cousin Lisa took me to the game. I can’t remember a thing about it except that it was snowy and cold. Not sure I could’ve even told you who was playing until reading your story today. Even though I’ve probably been to less than five CFL games in the past 35 years, one of them was just a couple of weeks ago. I took your nephew (that would be my son Jorey) to the Argos/Ti-Cats playoff game in Hamilton on Nov. 15th. It was a great game – the Ti-Cats won on the last play but we had a total blast. I told Jorey that I had gone to Argo games before I ever went to a Jays or even a Leafs game but that this was the first time I had ever gone to see the Argos on the road. It was a lot of fun and quite interesting to see up close the fans of a CFL team in a city that actually cares! I think Jonathan got his ho-hum view of football from me. I was a baseball fan from the time I was a kid. I remember a game where Jonathan sat with his back to the field and actually watched the rowdy fans in our section instead. They even offered him a beer. He declined. But what I remember the most was when Dad was away and I took you guys to the game by myself. At half time you went to the washroom by yourself (at that time it was okay) but when half time was over you didn’t come back. I went around the stadium trying to find you, even sent a gentleman into the men’s room to check. When you weren’t there I went to the officials and in a minute a big booming voice came over the PA system and bellowed “will Eric Zweig please go back to his seat.” And then a sheepish Eric came back to his seat. Seems you found a seat closer to the field and thought you would watch from there. Actually, I decided I wanted to catch a ball if it got kicked through the end zone and went around to the end of the stadium. (There weren’t even seats back there!) I remember people cheering as I starting jogging back around the field to return to our seats. So enjoyed reading this article, as well as the comment from your mom. That was something I had never heard before. Wasn’t the 1976 Ottawa/Edmonton game the one that was called and continued the next day? And isnt that the push that got the Skydome building started? My memory tells me that premier Bill Davis was one of the people that made it happen. We sure needed it. You’re mixing up a couple of different stories… It was an earlier game that got split over two days (“Fog Bowl” 1962, I think. And it was the 1982 game that got the push started for the Skydome.